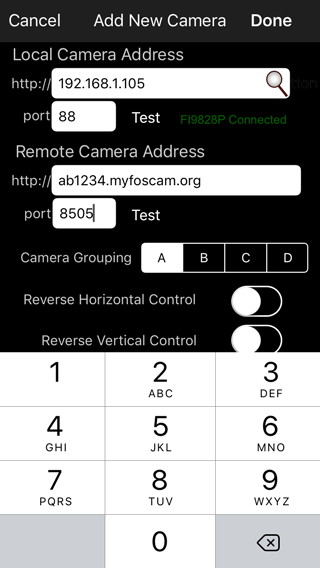 The following guide will show you how to setup Foscam cameras and the Foscam Pro iPhone app or iPad app for reliable local (while your iPhone or iPad is on the same network as the camera) and remote viewing (while your iPhone or iPad outside your home network). This is the best, most reliable Foscam Setup. By setting up with this guide, you will get the fastest connection possible to your camera and your setup won’t fail later due to IP changes of your camera or your network. It also doesn’t rely on the Foscam P2P servers (using the QR Code) which are sometimes down, or very slow. 1a. Connect the camera to the network and locate it. 1b. Change the camera’s IP to static so that it doesn’t change on you. 1c. Setup Foscam Wi-Fi if you plan on using the camera without the Ethernet cable attached. 2. 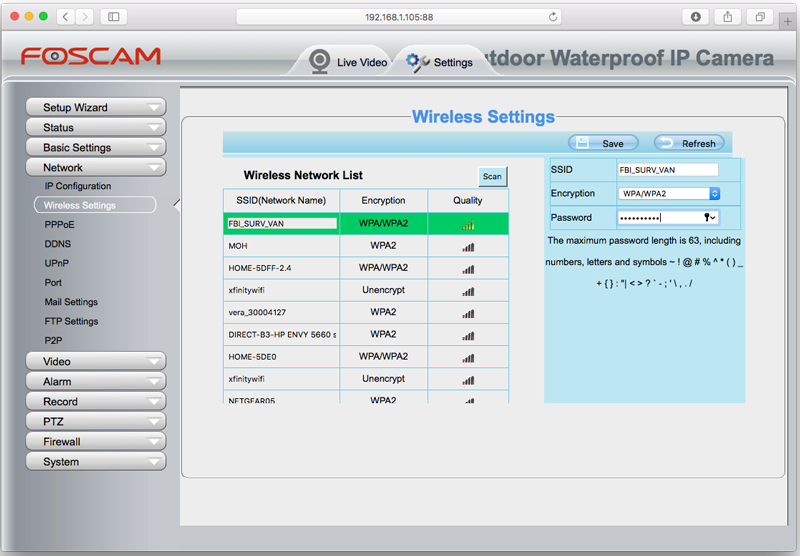 Setup Foscam cellular and remote access from outside your home or business network. 2b. Make sure your camera’s DDNS address is active. 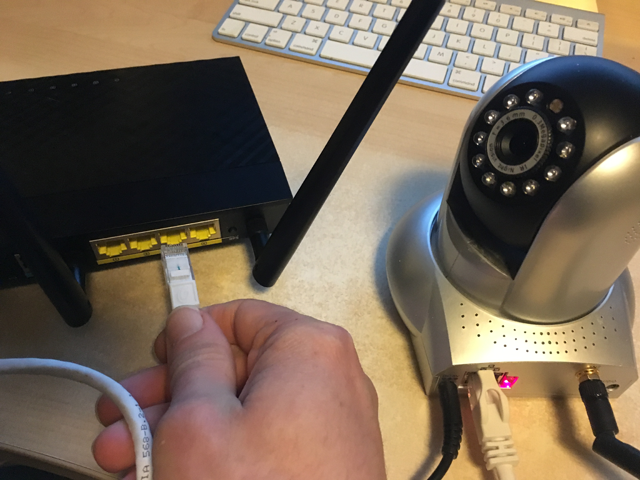 -Plug the ethernet cable into the camera and into a free open port on your router. -Power on the camera and wait about a minute. -Use the IP Camera Search Tool software that came on the CD with your camera to locate the camera on the network. 1b. Change its IP to static so that it doesn’t change on you. If you skip this step, the camera’s local IP address may change in the future. It could be today, it could be in three weeks, you won’t know until it happens. 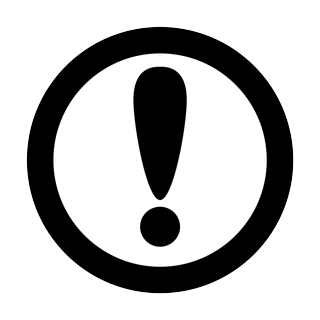 This will prevent you from connecting locally and if you have setup remote access, it will break that configuration as well. -Double click the camera in the Search Tool window. This will open the camera’s web interface in a browser window. -Download and install any plugins requested by the web page. (Chrome browser may not work). -Login to the camera. The default username for most cameras is “admin” without the quotes with a blank password. The camera may prompt you to change the camera password at this point. Do it. -Once logged in, you should see live video from the camera. -Click on the SETTINGS tab at the top of the page, then click on NETWORK on the left, and then IP CONFIGURATION. -As you can see in the image above, this camera has the “Obtain IP from DHCP server” checkbox checked and all other settings are disabled. When the “Obtain IP from DHCP server” checkbox is checked, your router gives the camera its IP address and it can change. This is not good. We want a static IP address for the camera. -UNCHECK the “Obtain IP from DHCP server” checkbox. The rest of the controls should become enabled as seen below. 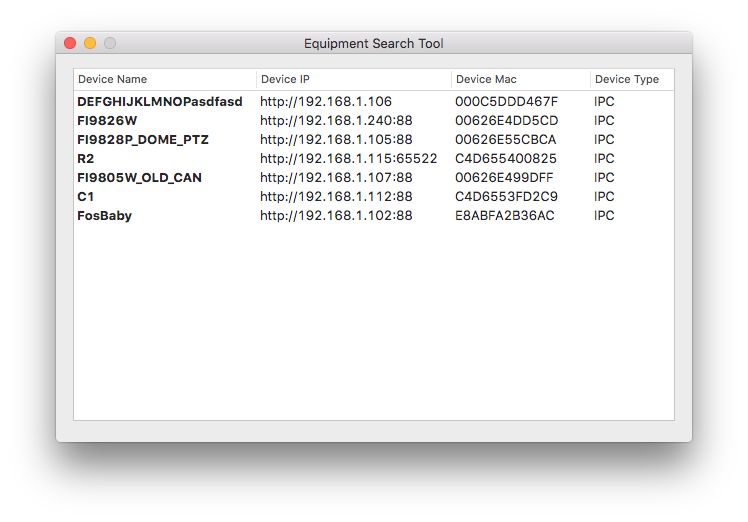 In the IP Configuration Window, you can see the camera’s network configuration. Based on the settings in this window you can see some information about the network. Your network may be different. Notice the camera’s IP address is 192.168.1.204, this is the current IP address of the camera that we want to change. Notice that the Gateway is 192.168.1.1, this is the IP address of the router that the camera is attached. Remember or write down the Gateway (router) IP address as you will need it later when setting up remote access. Your IP addresses may look different. Other common IP schemes are 10.0.0.X and 192.168.0.X where X represents the last number and the address of a device. Everything on your local network will have one of these IP addresses. (For instance, check the Wi-Fi settings on your iPhone or iPad. If you tap the info icon next to your Wi-Fi network name, you can view your devices IP address and router IP address. The last number of a typical valid IP address will be between 2 and 254. For example on this network valid IP addresses range from 192.168.1.2 to 192.168.1.254. Again, the first three digits of your network may be different, so always substitute yours wherever needed. You will need to determine an IP address for your camera outside of your router’s DHCP scope. The DHCP scope is the range of addresses that your router assigns to devices that do not have a statically assigned IP. It automatically gives numbers from this pool. manual or configuration to be sure. -We need to choose an IP address outside that range to avoid conflicts. In the IP Configuration Window, change the current IP (in this case 192.168.1.204) to the IP address you chose (in my case 192.168.1.105). -The camera may prompt you to be sure, select YES and wait for the camera to reboot. -Close the browser window and wait a couple of minutes. step (1d) below. 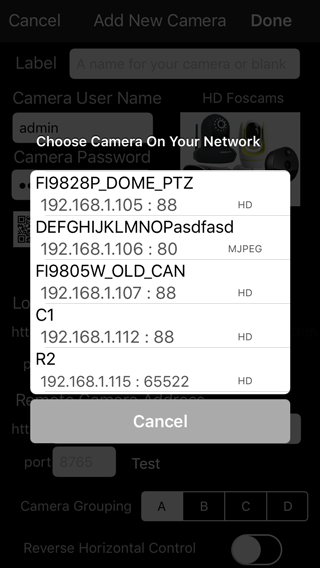 If you want your camera to connect wirelessly to the router, please do the following steps.-In the Foscam Camera Search Tool, double click on your camera to open it in a browser window and login with your username and password. -Go to the SETTINGS tab at the top, and then click on NETWORK on the left and then WIRELESS SETTINGS. 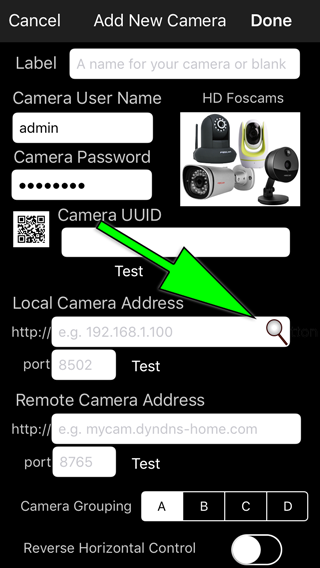 -Right click the IP Camera Search Tool and refresh the cameras. Your camera and its new IP address should show up in the list. -Double click the camera in the search tool to open it in a web browser. You should now be able to login to the camera at that address. You have successfully given your camera a static, non-changing IP address. 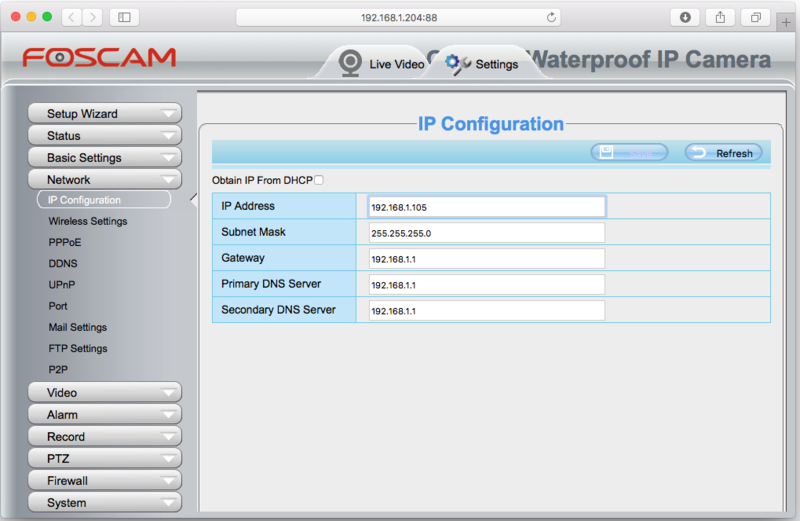 Make sure you close the IP Camera Search Tool as it will interfere with Foscam Pro in the next step. 1e. Add the camera to Foscam Pro app and test it. -In the lower left corner, tap Edit Cams. -Enter the CAMERA’s username and password. -If present, tap the small magnifying glass next to the local address field in the app. 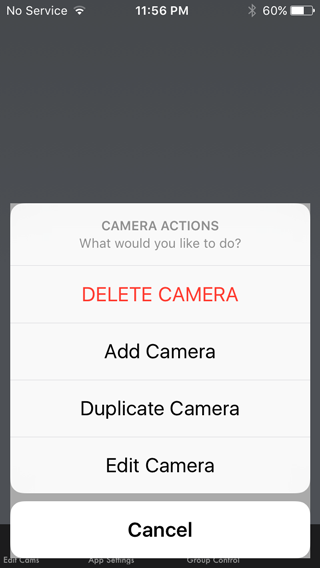 Your camera should appear in a list. Select your camera and it will populate the local address field for you. It should also automatically select the correct model camera for the model selection. cameras, select “HD Foscams” at the top of the model selection. -Tap the test button under the local address to test the connection. -Tap DONE. You should now see your camera connecting and displaying images in Foscam Pro. Continue to Step 2 if you want to view your camera while away from your home network. -If you found your DDNS address, skip to step b. Otherwise, proceed to a2. If your camera does not have a DDNS address your router probably supports this service. There are various DDNS address servers on the web that will work with your wireless router or Foscam camera. 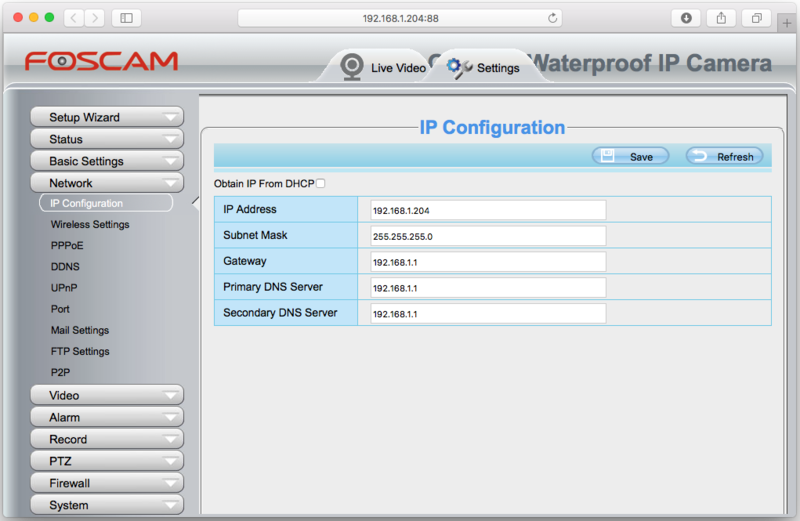 You can use the no-ip account with either your router’s DDNS update process (refer to your router manual for details) or with the Foscam camera’s DDNS update service. 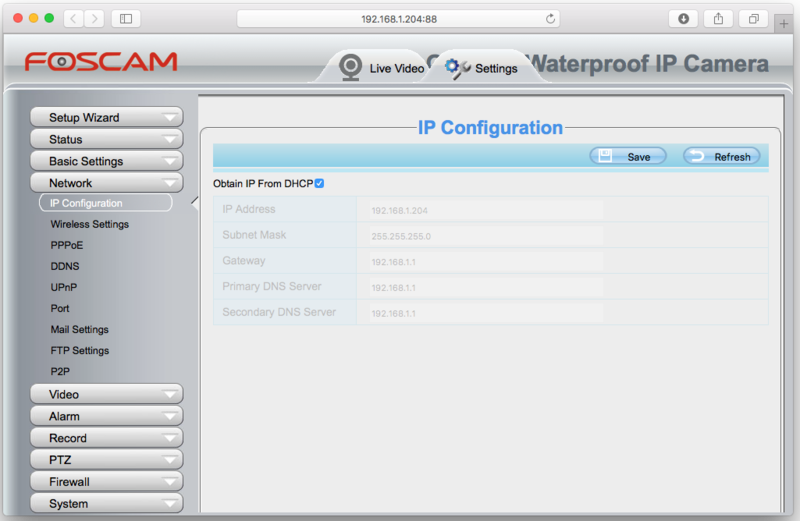 To setup Foscam’s DDNS update service, open the camera’s web interface, go to the settings and there is a section for DDNS near the IP Configuration section we used earlier. -Enter the domain name you setup with No-IP. -Enter your DDNS username and password that you setup with No-IP. 2b. Make sure to set up Foscam’s DDNS address and verify it is working. http://www.mydnstools.info/resolve/The page will tell you what IP address your remote address is resolving to.-Make sure it matches the IP of your home network. Your home network IP can be found if you visit http://synapticedge.com/yourpublicip/ from a computer or device that is on your home network.If it matches, great. If not, check that your camera’s DDNS service is running or try rebooting the camera. If you setup the DDNS update service on your router, check your router settings or try rebooting your router. When outside your home network, your DDNS address will direct outside web traffic to your router, but we need to get the outside traffic to your specific camera on the network. We do this with a port number. Your DDNS address is similar to a street address. Your remote port number will act similar to a specific numbered address on that street. Port numbers can range between 1 through 65535, however many are reserved and some are used by other programs. I recommend using remote port numbers between 8501 and 8599 as they don’t normally conflict with any other service and are not blocked by most network administrators. We need to configure your router so that it port forwards to the camera’s local IP address and port. We didn’t change the camera’s default port number. On HD Foscam Camera’s the default HTTP port number is 88. On the SD 89xx series cameras the default http port number is 80. Every router is a little different, but there should be a page in your router’s web interface for Port Forwarding. In this example, we learned above that our router’s IP address was 192.168.1.1 yours may be different. To get to the router’s web interface type http://192.168.1.1 into a web browser’s address bar. -Select your router’s Manufacturer on the first page. -Select your router’s Model on the next page. -Select any Foscam 89xx series or 98xx series on the next page. That will take you to specific instructions for your router for setting up port forwarding. Ignore the port number and IP that they use on that page and setup the one that you are configuring. In our example case, we are forwarding external port 8905 to our local camera’s IP address and port (192.168.1.105 port 88). Your router will most likely look different, but will have similar fields. Your router may require that the internal port be the same as the external port. If so, go to your camera’s web interface and change the port number for http. Once you have completed your port forwarding, we can now test if you can get to your camera’s web interface in a browser. -Type your DDNS address from your camera or from your DDNS service provider in a browser window, followed by a colon, and your remote port number. Another example, if you used the No-IP service instead of the cameras DDNS address may look like. If it is working, great. If not, verify that your DDNS has your current IP as shown above and double check your router port forwarding settings. -Tap the camera thumbnail you want to edit. -Enter your remote port number into the remote port text field. You should now be able to view the camera remotely. To make doubly sure, turn off your iPhone or iPad’s Wi-Fi and test over a cellular connection. We hope this helped you get your Foscam setup for local and remote viewing. If you get stuck on any step or are having other problems, please contact us through the “Contact Support” button on the app’s info page. When asked to include settings, select YES and then describe the problem you are having or where you are currently stuck.